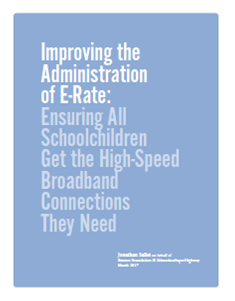 In the past five years, much has been accomplished; indeed, as Improving the Administration of E-Rate: Ensuring All Schoolchildren Get the High-Speed Broadband Connections They Need states, more than 35 million students have gained access to high-speed broadband in their schools since 2013 and EducationSuperHighway research concludes that ninety-eight percent of public schools now meet the FCC’s interim goal of 100 kbps per student for internet access. But there is still more to do. Over 1,300 schools, with 2.3 million students, still need access to the fiber-optic cables that deliver today’s broadband capacity, speed, and performance. And there is still much work to be done to achieve the FCC’s ultimate goal of 1 Gbps per 1,000 students (or 1 Mbps per student). This analysis, which has been presented to the FCC, recommends tangible steps that the commission should take to instruct the Universal Service Administrative Company on how best to speed the approval of E-Rate projects that meet the legal requirements of the Telecommunications Act. The issues may seem arcane, bureaucratic, and/or legalistic. But they are important for two interlocking reasons. First, of course, the goal of bringing broadband to schools and libraries remains absolutely critical. To be unconnected from broadband is more and more of a disadvantage in America today. And, if anything, the importance of broadband connections to public institutions is only becoming more critical. Today’s students need broadband where they learn, not only where they go to school (a phenomenon rightly termed by Commissioner Rosenworcel as the “homework gap”). And, as trusted guides, libraries are increasingly important as institutions where digital inequality can be combatted. Second, competition is a critical component of America’s broadband future. One of the issues discussed in this white paper is the importance of recognizing the competitive bidding process schools and libraries undertake so they can receive the benefits of the best broadband facilities at the most cost-effective terms. Sometimes that process will result in new fiber construction rather than merely subscribing to an existing service but, of course, that is a fundamental promise of competition – to introduce new and better ways of doing things. The opportunity to extend transformative digital learning is vast; to grasp that opportunity requires both bold vision and effective administration. With both, we can extend the ability of our children to learn – not just to the next school building or for the next school year, but for the entire next generation. That’s because the one thing we can be sure of is that while today’s students may make up just 15% of our population, they make up 100% of our future. Jonathan Sallet is a Benton Senior Fellow. He works to promote broadband access and deployment, to advance competition, including through antitrust, and to preserve and protect internet openness. He is the former-Federal Communications Commission General Counsel (2013-2016), and Deputy Assistant Attorney General for Litigation, Antitrust Division, US Department of Justice (2016-2017).